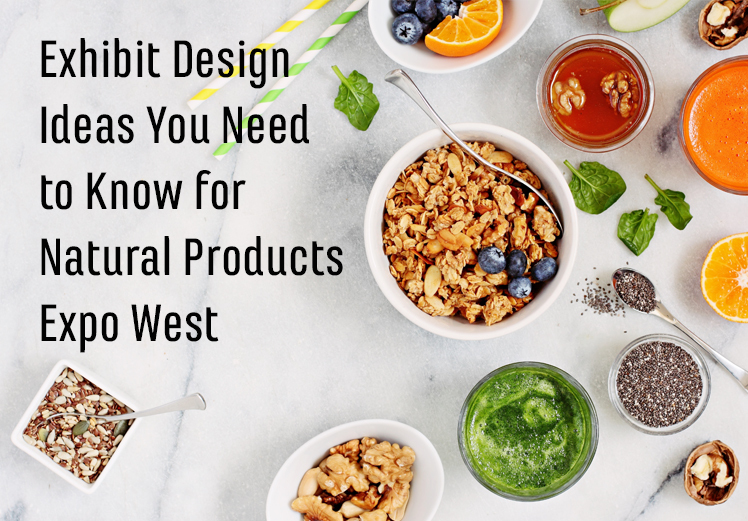 Are you exhibiting at Natural Products Expo West and need help with a new design idea? Want to stand out but aren’t sure what design techniques to use? Here are some tips and tricks to help you get started. 3D lettering is a creative and bold way to stand out than the common alternative, printing on a banner stand or tablecloth. Another way to really make your signage pop is by adding backlit lighting. We know that you want your potential clients to know everything about your company in a glance, but over cluttered text can become very overwhelming. Avoid putting a whole brochure on your booth. Let your booth design do the talking. Having an interesting and unique concept will invite your customers in. Once they have approached your booth, then you can talk to them about your product and or hand them literature. Don’t scare them away before they even enter your booth. Wood has always been a popular material at Natural Products Expos. To help your booth stand out you can use wood in unique ways. Some ways to achieve this is by using repurposed wood for tables or shelves, using exposed beams to give your booth height, or print a wood graphic to mimic wood. Use lighting in a cool way. Whether it’s using colored lighting to match your brand colors or using unique light fixtures. Having a well-lit display will increase traffic flow to your booth. Just like using too much text on your booth, there is nothing worse than cluttering a great booth design with crowded shelves. Keep it simple and limit the amount of product you display, so that the potential buyer’s eyes will not be overwhelmed. Don’t be afraid to use color! Keep it limited, no more than 2 or 3 colors, but still take advantage of it. People are more attracted to color than black or white. So use this rule of thumb in your booth to grab the attention of your audience. Having organic and curved shapes draws in the eye more than straight lines and squares. Since, the trade show’s focus is organic and natural foods, play with that theme. Make your booth fun and be creative with shapes. Having unique wall shapes and back walls will leave a lasting impression on your customer. Are you looking for a budget friendly booth for NPEW? Or need to save on shipping and dismantling expenses? Here are some portable display options to help save on shipping and labor. Natural Products Expo West is one of the most notable natural product trade shows in the country. Thousands of industry leaders will be in attendance with buying power. It is important to convert those potential clients into customers. Now that you have your booth size and type you can select your style to get design ideas. Are you exhibiting a natural product at NPEW? Our product display shelves and counters make it easy for you to show off your exciting products and entice a crowd to see a demonstration. Get in touch with us and we will help you find the right solution for your product line! We provide options that allow you to hide extra items behind counter doors, but if you aren't carrying extra stock, a storage-free counter and shelf system is the more economical choice.